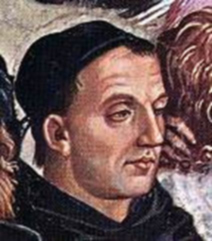 John of Fiesole, known as Fra Angelico was a Dominican painter in the mid fifteenth century, known for the beauty of his paintings and the holiness of his priestly life. Given the name Guido at baptism this saint was born in Florence, at the end of the fourteenth century. Having entered the Dominican convent in Fiesole, he was given the name Brother Giovanni. After ordination, he held various responsibilities, one of which was the prior of the convent in Fiesole. Faithful to the promises, he made as a Dominican to the preach the Gospel after having contemplated it in prayer, Fra Angelico put his creativity at the disposal of the Lord. With brush and paint in hand, he used his talents to transmit to all people the sublimity and the redemptive strength of the divine mysteries. Between 1425 and 1447, Fra Angelico carried out his activity for the Dominican convents and other ecclesiastical institutes at Fiesole, Florence, Cortona and Orvieto. The fame of his genius merited him the esteem of Pontiffs Eugenio IV and Nicolas V, who contracted him for the task of frescoing several rooms in the Vatican palace. Fra Angelico died in 1455 and was buried in Rome. The virtue and profound religious spirit which characterised the life of this artist and his life as a Dominican is reflected in his spirituality, his purity and the luminosity of his art.